Justice Sonia Sotomayor attacked the amendment passed by Michigan votes in 2006 that ended affirmative action, arguing it would bring back segregation. But Chief Justice John Roberts said colleges can still aim to diversify without racial preferences. Michigan is one of eight states that have banned affirmative action. NBC's Pete Williams reports. 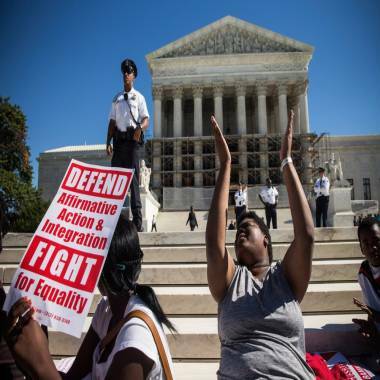 Demonstrators crowded the sidewalk outside the U.S. Supreme Court on Tuesday as the justices took on the hot-button issue of affirmative action, hearing oral arguments in a case about Michigan's voter-backed ban on using race as a criterion in college admissions. The gathered advocates urged the top court to stand by a 2003 ruling which held that the country's colleges can choose to use affirmative action practices in deciding which students to admit. At issue is whether a 2006 Michigan constitutional amendment that blocks the state from taking account of race and gender in public education, employment and contracting constitutes discrimination or preferential treatment. "It's wrong to treat people differently based on your race or the color of your skin," said Michigan's attorney general Bill Schuette, whose office is defending the Proposal 2 measure. "So we're saying: 'Equal treatment under the law.' That's our approach in Michigan." But opponents of the ban sued and won in a federal appeals court, arguing that the prohibition is tantamount to discrimination, blocking only minority students from seeking preferences in school admissions. Students protest in support of affirmative action, outside the Supreme Court during the hearing of "Schuette v. Coalition to Defend Affirmative Action" on Oct. 15, in Washington. During Tuesday’s courtroom argument, Mark Rosenbaum, a lawyer for the American Civil Liberties Union who argued to strike down the Michigan measure on behalf of University of Michigan students and faculty, said that other groups pursuing preferential treatment in school admissions could appeal to administrators, only race may not enter the conversation. “I want the same rule book. I want the same playing field. The problem with Proposal 2 is that it creates two playing fields,” Rosenbaum said, according to the Associated Press. Justice Sonia Sotomayor was the most outspoken justice on the bench about the Michigan ban, at one point saying: "It was intended to bring back segregation, and appears to have done just that." When Michigan Solicitor General John Bursch, the state's representative in court, suggested Michigan could get rid of legacy admissions as a way to admit a more diverse student body, Justice Sotomayor remarked: "The minorities finally get in and have children, and now you want to do away with alumni preferences." And yet a bare majority of the justices appeared to believe that Michigan's ban could withstand a constitutional challenge. Chief Justice John Roberts asked: "Why can't a state say, 'Do all you can to achieve diversity without racial preferences?'" And Justice Antonin Scalia defended the Michigan measure, which 58 percent of the state's voters approved, saying: "It's not a racial classification. It's the elimination of racial classification." No matter the outcome of Schuette v. Coalition to Defend Affirmative Action, any ruling is likely to fan the flames of the decades-old debate over affirmative action. A ruling that strikes down the Michigan ban could send dominoes toppling across the country, potentially threatening bans in seven other states — Arizona, California, Florida, Nebraska, New Hampshire, Oklahoma and Washington. And a move to uphold the Michigan amendment could represent a victory for affirmative action opponents, who may attempt to recreate their wins at the ballot box in other jurisdictions. Tuesday's oral arguments came just four months after the justices avoided a major decision on the race-based admissions policy at the University of Texas at Austin, ruling instead to send the closely-watched case back to the lower court. In a June 7-1 vote, with Justice Elena Kagan having recused herself, the justices said an appeals court did not apply the proper standard in determining whether the university's policy runs afoul of the Equal Protection Clause of the Constitution. That case, Fisher v. University of Texas at Austin, was brought by a white student who claimed she was turned away from the University of Texas while racial minority students with lower standardized test scores were mailed acceptance letters. The Michigan case arrives at the Supreme Court after time in front of a federal appeals court in Cincinnati. The 6th U.S. Circuit Court of Appeals, in an 8-7 decision, said the Michigan provision violates the Equal Protection Clause of the 14th Amendment of the Constitution as it places a burden on affirmative action boosters who would be forced to launch their own extensive, circuitous campaign to strip the constitutional provision, according to the AP. That burden "undermines the Equal Protection Clause's guarantee that all citizens ought to have equal access to the tools of political change," Judge R. Guy Cole, Jr., write for the majority on the Cincinnati appeals court. Opponents allege that due to the ban, proponents for racial considerations in admissions are blocked from directly lobbying universities like those seeking to use other advantages — such as family alumni "legacy," for example. Instead, those opponents would be required to push for the passage of an entirely new amendment to the state constitution, reversing the 2006 voter-backed measure, Reuters reported. The Michigan case, like the Texas one, will be heard by only eight of the top court's nine justices. Justice Kagan, who prior to her 2010 appointment was the U.S. solicitor general and managed some affirmative action litigation, has rescued herself. The long-simmering debate over affirmative action dates back to the early 1960s, when President John K. Kennedy first called on federal contractors to take "affirmative action" to hire racial and ethnic minorities, according to the National Conference of State Legislatures. In a 1961 Executive Order, President Kennedy directed government employers to take "affirmative action to ensure that applicants are employed, and that employees are treated during employment, without regard to their race, creed, color, or national origin." For more than a quarter-century, the Supreme Court has often been at the center of pitched legal and political battles surrounding the issue. In the watershed Regents of the University of California v. Bakke case in 1978, brought by white aspiring medical student Allan Bakke, the top court outlawed quotas but said educational institutions could balance race against other admissions criteria. African-American and Latino enrollment at the University of Michigan has plummeted since the prohibition on affirmative action went into affect, according to the AP. And at California's leading public universities, African-Americans make up a smaller share of incoming freshmen, while Latino enrollment has spiked slightly — although still far below the state's growth in the overall percentage of Latino high school graduates, according to the AP. Some 86 percent of people surveyed by Pew Research said society "should do what is necessary to make sure that everyone has an equal opportunity to succeed." And yet only a third of Americans surveyed agreed with the statement: "We should make every possible effort to improve the position of blacks and other minorities, even if it means giving them preferential treatment." NBC News' Polly DeFrank, The Associated Press and Reuters contributed to this report.